Alfred Charles WARD was born in Rugby and christened on 11 March 1900 at St. Andrew’s church, Rugby. He was the fourth of six sons – there were also two daughters – of Charles Ward, who was born in Storrington, Buckinghamshire, in about 1863 – his father was a ‘labourer’, – and Rose Ellen, née Jackson, Ward, who was born in Stanford Baron, Northamptonshire, in about 1867 – her father was a ‘carpenter’. They had married on 20 September 1886, at St. Martin, Stamford Baron, when Charles was working as a ‘railway fireman’. The family moved several times, as Charles had pursued his railway career: their first three children were born in Stanford Baron; then from 1897 to 1900 they were in Rugby where before early 1900, Charles had been promoted to be a ‘engine driver’. In 1902 a child was born in Swinton, Yorkshire; and between 1906 and 1910 their children were born in Netherfield, Nottinghamshire. By 1911 they were back in Rugby. In 1900, the family were living at 13 Oxford Street, Rugby, and then by 1901 the family had moved to the New Building, Queen Street, Rugby, and Alfred’s father was a ‘railway engine driver; there were now five children between 14 and one. By 1911, Alfred was 11 and a ‘schoolboy’ and the family had moved back to live in Rugby again, in a six room house at 121 Grosvenor Road. Alfred’s father was a ‘Locomotive Engine Driver’ for the London & North Western Railway. By 1911 Alfred’s parents had been married 24 years, they had had nine children, one of whom had died; six were still living at home and their ages ranged from 18 to one year old. With only the minimum details on his Medal Card and no surviving Service Record, it is difficult to reconstruct Alfred’s service history. At some date he enlisted as a Private, No.41088, in the Royal Warwickshire Regiment (R.War.R.). When he died in 1918, he was with ‘C’ Company in the 15th Battalion, R. War. R..
His five figure service number is likely to have been issued earlier in the war, but he would not have been 18 and eligible for overseas service until 1917. He did not win the 1914-1915 Star which again indicates that he did not go to France until after late 1915. The 15th Battalion (2nd Birmingham) Royal Warwickshire Regiment had been formed in Birmingham by the Lord Mayor and a local Committee in September 1914. The Battalion moved to Sutton Coalfield and then in June 1915 to Wensleydale to join the 95th Brigade of the 32nd Division and later moved to Salisbury Plain. The 15th Battalion mobilised for war and landed at Boulogne on 21 November 1915 and on 14 January 1916 transferred to the 13th Brigade in the 5th Division. In March 1916, and probably still well before Alfred joined up, the Division took over a section of front line near Arras, between St Laurent Blangy and the southern edge of Vimy Ridge. When the Somme offensive opened on 1 July 1916, the 5th Division was enjoying a period of rest and re-fit and was in GHQ Reserve. However, this restful time was not destined to last and later in July 1916 they moved some 50 miles south to reinforce the Somme. In early April 1917 the Battalion moved to Arras for the various phases of the Battles of Arras, starting with the attack on Vimy Ridge from 9-12 April 1917; and then the three Battles of the Scarpe, 9-14 April; 23-24 April 1917; and 3-4 May 1917; and the subsidiary attack on La Coulotte on 23 April 1917, and then, on 8 May 1917, the 15th Battalion, Royal Warwickshire Regiment was ordered to attack the German-held village of Fresnoy [Fresnoy-en-Gohelle], about 8 miles north-east of Arras and west of Vimy. The Battalion also took part in the Battle of Polygon Wood in September 1917; the Battle of Broodseinde (4 October); the Battle of Poelcappelle (9 October 1917); and the Second Battle of Passchendaele (July to November 1917). In late November to early December 1917, the Battalion moved from France to Italy to strengthen the Italian Resistance. Some four months later, by which date it is likely that Alfred was with the Battalion, they returned to France by train in early April 1918. The Battalion War Diary refers to the attack on Merville on 12 April and subsequent heavy shelling, it also notes that in May the Battalion was alternating between ‘the Front’ and periods ‘In Reserve’. These were quieter times until the end of the month when a larger raid was carried out on the night 28/29 May, when two Machine Gun posts were attacked, the garrisons killed, the machine guns put out of action, and some prisoners taken. The raid took only 20 minutes – with ‘eight slight casualties’. After the German Offensive had been halted and the situation stabilised, preparations were made for what became the ‘100 Days Offensive’. The 15th R.War.R. were involved with the Battle of Albert (21–23 August 1918); the Battle of Bapaume (21 August 1918 to 3 September 1918); the Battle of Drocourt-Queant (2-3 September 1918); the Battle of the Epehy (18 September 1918) and the Battle of the Canal du Nord (27 September – 1 October 1918). The Battalion War Diary relates the actions in the days leading up to this latter battle. At the start of September 1918 the Battalion was in Reserve some 8 miles south-west of CAMBRAI. The Battalion stayed in place [SW corner H.14.C. – Map 57c N.W. 1:20,000] when the 13th Infantry Brigade was relieved by the 63rd Inf. Brigade on 4 September. They moved to the Quarry, where they rested and cleaned up, and then had various training until 12 September when the 13th Brigade was to relieve a support Brigade of the New Zealand Division in YTRES. On 14 September, the 15th RWR were to relieve the 1st New Zealand Wellington Battalion at midnight. So far that month they had had no casualties. There was however an attack planned for 26 and 27 September 1918. 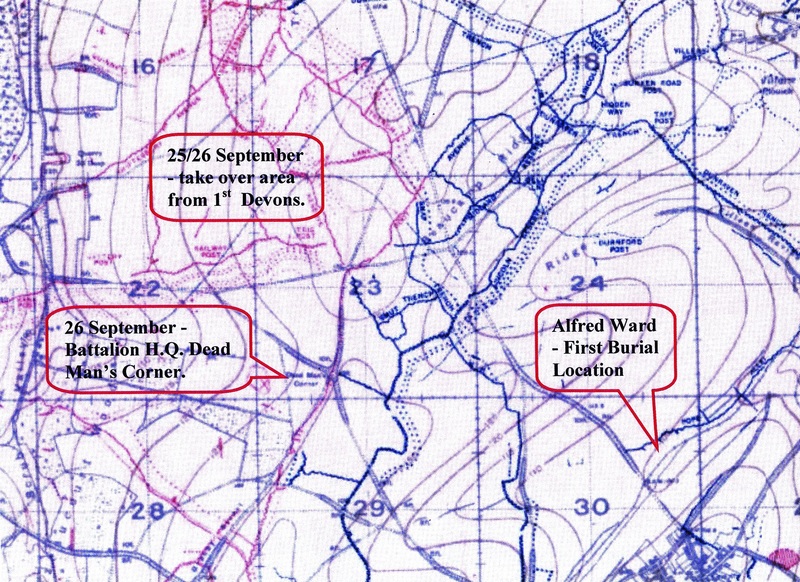 27 September – The attack is carried out on a three Coy. Front … 5.30am Zero hour … 15th R. War. R. attack at zero plus 152. Battalion attack & gain objective, but is obliged to retire. Casualties: Officers: Killed 3 (inc. MO), Wounded 5, one Wounded since died. Other Ranks: Killed, 36. Wounded, 90. Missing, 29. 2 Wounded at duty. The next day patrols resumed, and the enemy was withdrawing. There was an ‘Officer Patrol’ to GOUZEAUCOURT, which is on the plan, just to the south of where Alfred was first buried. As others advanced through their positions, the 15th Battalion remained in place as a reserve – some of the men received ‘wounds by gas’ after being shelled, apparently by their own HQ. Alfred died, aged only 19, on Friday, 27 September 1918, and was one of the 36 men killed that day. He was originally buried at map reference: 57.c.Q.30.b.7.6., with at least five other members of the 15th Battalion, one of whom also died on 27 September and four who died on 29 September 1918. This location appears to be in or adjacent to ‘Pope Trench’ which had been an enemy trench before the attacks, and confirmed that the Battalion had made good progress in their advance, before being forced to retire. After the war, these six graves were ‘concentrated’ – soldiers who were originally buried in smaller or isolated cemeteries, were, at a later date, exhumed and reburied in larger war cemeteries. The ‘concentration’ of cemeteries allowed otherwise unmaintainable graves to be moved into established war grave cemeteries where the Commission could ensure proper commemoration. Alfred and his fellow soldiers were reburied in the Gouzeaucourt New British Cemetery. Alfred was reburied in Grave Reference: VIII. B. 16. His family had requested the first line of the Lord’s Prayer, ‘Our Father which art in Heaven, Hallowed be Thy Name’, to be added to his gravestone. Gouzeaucourt is a large village 15 kilometres south west of Cambrai and 15 kilometres north-east of Peronne. Gouzeaucourt New British Cemetery is opposite the civil cemetery. Gouzeaucourt village was captured by the 8th Division on the night of 12-13 April 1917. It was lost on 30 November 1917 in the German counterattack at the end of the Battle of Cambrai, and recaptured the same day by the 1st Irish Guards. It was lost again on 22 March 1918, attacked by the 38th (Welsh) Division on the following 18 September, and finally retaken by the 21st Division on 8 October. The cemetery was begun in November 1917, taken over by the Germans in 1918, and used again by Commonwealth forces in September and October 1918, but the original burials (now in Plot III) are only 55 in number. It was enlarged after the Armistice when graves were brought in from other cemeteries and from the battlefield of Cambrai. Alfred was awarded the British War Medal and the Victory Medal, and he is also remembered on the Rugby Memorial Gate, and on a family grave, No: M118 in the Clifton Road Cemetery, Rugby. His family continued to live at 121 Grosvenor Road, Rugby after the war. Alfred had three brothers who also served during the First World War. This article on Alfred Charles WARD was researched and written for a Rugby Family History Group [RFHG] project, by John P H Frearson and is © John P H Frearson and the Rugby Family History Group, June 2018. WWI War Diaries (France, Belgium and Germany), Royal Warwickshire Regiment, 5th Division, The National Archives Ref: Piece 1557: 13 Infantry Brigade (1915 – 1919). WWI War Diaries (France, Belgium and Germany), Royal Warwickshire Regiment, 5th Division, The National Archives, Ref: Piece 1557: 13 Infantry Brigade (1915 – 1919). Frank Wilfred SEDGLEY was initially impossible to find – except in some military records. However, a mistranscribed, Frank Sidgeley, was found with his grandparents, Charles, a ‘threshing machine proprietor’ and his wife, Harriet, in Shawell in 1891. A better lead was a family memorial in the Clifton Road Cemetery which allowed him, and his family, to be identified. Frank Wilfred Sedgley was the eldest son of John Charles Sedgley b.c.1860 in Shawell, and his wife Clara, née Goodwin, Sedgley, b.c.1850 in Deenethorpe, Northamptonshire. Their marriage in Shawell was registered in Q2 1881 in Lutterworth, and Frank’s birth in Shawell was registered in Q2, 1882, also in Lutterworth. The family moved from Shawell to Rugby sometime between 1885 and 1887, and by 1891, they were living, at 11 Dale Street, Rugby. John Charles Sedgley was a carpenter. There were five other children at home: Maud Sedgley, aged 6, had been born in Shawell. The younger children, Ada M Sedgley, 4; Annie Sedgley, 3; George Charles Sedgley, 2; and Florence C Sedgley, 1, were all born in Rugby. As noted above, Frank was with his grandparents in Shawell on that census night. In 1896, John Charles Sedgley was listed as a Carpenter in the Midland Times & Rugby Gazette. He was still at 11 Dale Street. By 1901, the family had moved to 7 Princes Street, Rugby. Frank was now a ‘Carpenter’s Apprentice’, presumably working with his ‘Carpenter’ father. All six children were still living at home. Frank’s eldest sister was working as a ‘Corset Maker’. John Charles Sedgley, Frank’s father, died aged only 46 years, on 18 September 1905. Frank married, after banns, some four years later on 12 April 1909, at New Bilton Parish Church, with Ada Elizabeth Stevenson. He was 27 and a ‘carpenter’; she was 20 and had been born in New Bilton. Her father was a labourer. They both gave their address as 200 Lawford Road, New Bilton. Later that year, they had a son, George, who was born on 2 October 1909, and who was baptised as ‘Cyril Charles George Sedgley’ on 3 November 1909 at St Matthew’s church, Rugby. They were then living at 44 Pennington Street, Rugby. In 1911, Clara, Frank’s widowed mother was still living at 7 Princes Street, with her four youngest children, now aged 26 to 21. Frank and his wife, Ada, had moved to live in New Street, New Bilton. Frank was now working as a labourer for the council and their son was one year old. They had a ‘bill poster’ as a border, and it seems they were also sharing their four room house with an ‘Artist’, Timothy Bourne Whitby and his wife. According to the ‘UK, Soldiers Died in the Great War, 1914-1919’, Frank signed up in Coventry and the ‘UK, WWI Service Medal and Award Rolls, 1914-1920’ stated that he was initially a Private, No.267927, in the Royal Warwickshire Regiment, and was later posted as a Private, No.152327, in the Machine Gun Company (M.G.C. ), (Infantry). The CWGC records state that he was in the 25th Battalion of the M.G.C. The Machine Gun Corps was created so as to form a single specialist Machine Gun Company per infantry brigade, by withdrawing the guns and gun teams from the battalions. They would be replaced at battalion level by the light Lewis machine guns and thus the firepower of each brigade would be substantially increased. The Machine Gun Corps was created by Royal Warrant on 14 October 1915 followed by an Army Order on 22 October 1915. The companies formed in each brigade would transfer to the new Corps. … The pace of reorganisation depended largely on the rate of supply of the Lewis guns but it was completed before the Battle of the Somme in 1916. Machine Gun Battalions – as opposed to Companies – were formed in the Divisions in the early months of 1918, by bringing together the four MGC Companies into a single command structure. The Battalions took the number of their Division. In March 1918, the 7th, 74th, 75th, and 195th Machine Gun Companies joined the 25th Division to form the 25th MG Battalion as 25th Divisional troops. In 1918, they were in action on the Somme; the Battle of the Lys; the Battle of the Aisne, the Battles of the Hindenburg Line and the Final Advance in Picardy. Although 1918 had started fairly quietly, the anticipated attack by the Germans, Operation Michael, was launched on 21 March 1918, against the British Fifth Army and the right wing of the British Third Army. The German artillery targeted command and communications; then, the destruction of artillery; and then the front-line infantry. The artillery bombardment began at 4.40am on 21 March 1918, and hit targets over an area of 150 square miles, the biggest barrage of the entire war. Over 1,100,000 shells were fired in five hours. The 25th Division was unlucky during the 1918 German Spring Offensives, being attacked three times. It was on the northern flank defences during Operation Michael in March 1918 and was moved north to refit. There it lost more men in the Battle of the Lys attacks in April. Moved south to another quiet area, it was attacked for a third time in the Third Battle of the Aisne. After suffering severe casualties in June 1918, it underwent a major refit and reorganisation, with infantry from divisions then serving in Italy. The reformed division moved back to France in September 1918. Whilst the 25th Division underwent its refit, after the successive attacks of the ‘Spring Offensive’, from 23 July 1918 the 25th Battalion M.G.C. was transferred from the 25th Division to the 59th Division for three months, until it returned to the 25th Division on 19 October 1918 when the Division returned to France. There was considerable movement in this period and no doubt casualties would have occurred from enemy shelling in back areas and from sniping as they approached the Front. The Battalion Diary provides details of locations and operations whilst they were with the 59th Division. The 25th Battalion M.G.C. were in CREQUY from 1-17 July; they moved to BOIS DES DAMES from 18-23 July and then to MAGNICOURT on the 24 July and successively to SAULTY, and into the line in the BOYELLES-MERCATEL Section. They remained in MERCATEL from 1-24 August and then via LIETTRES to the LESTREM Sector from 27 August to 6 September, when they moved to the LAVENTIE Sector from 7 September to the end of that month. Frank Sedgely would thus still have been with the 59th Division when he was wounded, and this would have been at some unknown date before his death on 25 September. The Battalion Diary also provides details of the daily events immediately prior to Frank’s death, when the Battalion was at LAVANIE. There are no casualty reports in this War Diary, and it seems that Frank was an isolated casualty – or indeed may have been wounded some days before his death – as there seem to be no other 25th Battalion casualties on 24 or 25 September 1918. He was probably evacuated to a Field Ambulance, which had returned to an earlier location near the Pont-Du-Hem Military Cemetery, after the area was recovered in mid-September during the ‘100 Days Advance’ to Victory. The CWGC site does not include any Concentration Report, so it is likely that Frank was buried in the cemetery soon after his death. Frank Wilfred Sedgely was buried some 3km south-east from Lavantie, in grave reference: I. F. 8., in the Pont-Du-Hem Military Cemetery, La Gorgue, Nord, France. No additional family message was added to his memorial stone. Pont-du-Hem is a hamlet situated on the main road from La Bassee to Estaires. It is about 10km north-east of Béthune and the same distance west of Loos. Pont-du-Hem was in German hands from mid-April to mid-September 1918, during the ‘Operation Michael’ offensive. The Cemetery was begun, in an apple-orchard, in July 1915, and used until April 1918, by fighting units and Field Ambulances; these original burials are in Plots I, II and III, and Rows A and B of Plot IV. … After the Armistice, … British graves were brought in from the surrounding battlefields and from many smaller burial grounds, some of which are listed on the CWGC site. Frank was awarded the Victory and British medals – although it seems that his medals may not have found his family or may have been ‘returned’ as sometimes happened, perhaps his family did not want to be reminded of their loss. Frank is also remembered on the Rugby Memorial Gate; and on a family grave, No. H233, at the Clifton Road Cemetery, Rugby. As noted above, his father, John Charles Sedgley, died young on 18 September 1905, aged only 46 years, and his mother, Clara, outlived her husband by some 34 years, dying on 23 September 1939 aged 89. Frank’s sister, Annie Sedgley, is also remembered at Clifton Road – she predeceased Frank by some five months and died on 22 May 1918, aged 30 years. Frank’s younger brother, George Charles Sedgley, also enlisted but survived the war. His records, although possibly somewhat confused, still exist, but have not been analysed in detail at present. He was a Private, No:26355 in the Royal Berkshire Regiment and seems later to have been in the Devon Regiment and the Labour Corps. He joined up on 5 February 1916 and went to France on 14 June 1916. He was injured on 2 December 1918. He left France on 13 January 1919, and demobilised in UK on 11 February 1919. Frank and Ada’s son, George (above), was baptised as Cyril Charles George Sedgley, but was also known as ‘George C C Sedgley’. He married Violet Neal in 1930 in Rugby and they had a son Roger. In 1939, George was living in Southam and working as a ‘Skilled Worksman Post Office Engineering Dept, Cable Joiner Electrician’. From 2003-2005, named as Mr. Cyril C Sedgley, he was living at Flat 2, Dickinson Court, Barby Road, and he died as Cyril Charles G Sedgley, aged 96 in November 2005. This article on Frank Wilfred SEDGLEY was researched and written for a Rugby Family History Group [RFHG] project, by John P H Frearson and is © John P H Frearson and the Rugby Family History Group, May 2017. With many thanks to Christine Hancock who was able to provide the transcription. TNA, UK, WWI War Diaries (France, Belgium and Germany), 1914-1920, Machine Gun Corps, 59th Division, Piece: 3017/10: 25 Battalion, Machine Gun Corps (1918 Jul – Sep). Also available as 59 Div. Troops, 25 Bn, Machine Gun Corps 1918 July-Sept at http://www.nmarchive.com/search-the-war-diaries/. Information that he ‘Died of Wounds’ is given in UK, Soldiers Died in the Great War, 1914-1919.